I really enjoyed painting this one. 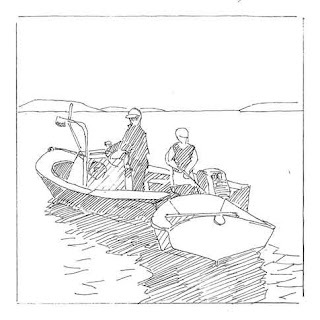 As many of your guessed, this is my husband and son taking our lobster boat out to the mooring, planning to return in the pram. Lots of attention is being paid to not wrapping the line around the prop or banging the pram into the engine of the larger boat. I love to row this pram, which my husband built. You can tell I'm thinking about summer! 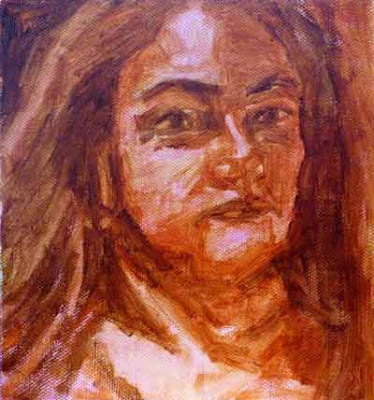 To see the sketch for this painting, click here. These two guys are looking at something. What do you think it is? I'm really getting into boats with figures. 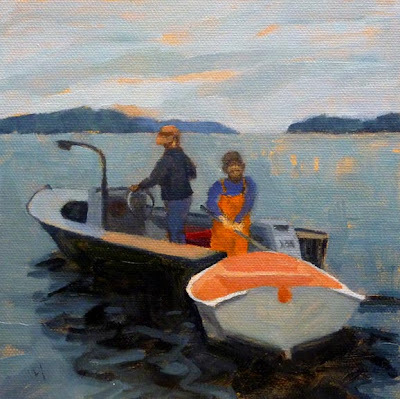 There is the challenge of sizing the figure against the boat, as well as how to show the posture with a minimum of strokes. And then, the duds are pretty colorful! Here, our friend Chris is taking my son along as "stern man". 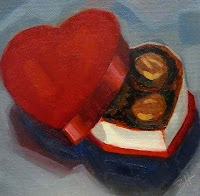 This one is special for me, not only do I love the composition, but I'm kind of sweet on the two guys as well. The lobster style boat is called Red Herring, and the beautiful pram is Isola Bella. Can you guess who the two fellas are? This gorgeous classic lobster boat is from Vinal Haven, where I saw her in Carver's Harbor one afternoon. It's fun to go there on the ferry from Rockland, with lots to see within walking distance from the ferry landing. I did do a sketch of this one first, but mucked it up with too much dark marker. I'll do another one and post it later. February has been a month for experimenting and trying new things. I spent some time with acrylic inks (fun) and acrylics (ugh) after being inspired by Scottish painter, Claire Harrigan. 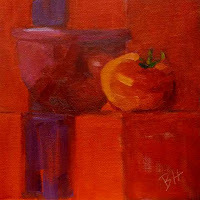 Take a look at her wonderful colorful and abstract still lifes and landscapes. I will need to spend more time with those ideas before I have anything to show. 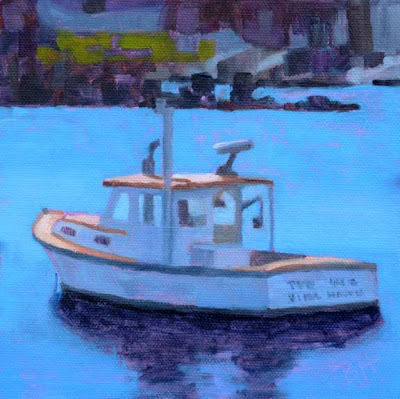 Then it was on to a project that has been in my mind for a long time, really learning how to paint boats. I've done a couple on the blog, but have never felt really comfortable that I was getting things right. So I thought if I did 10 or 20, I might get somewhere. 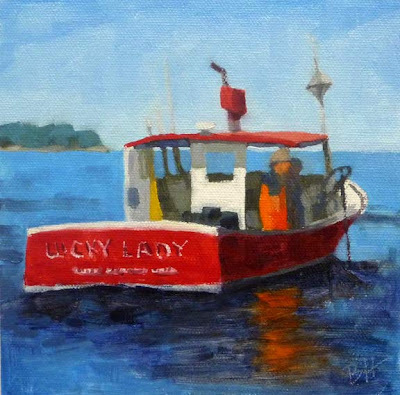 I started with some sketches (see previous posts) and this is my first painting, of the lobster boat Lucky Lady, out of East Boothbay. 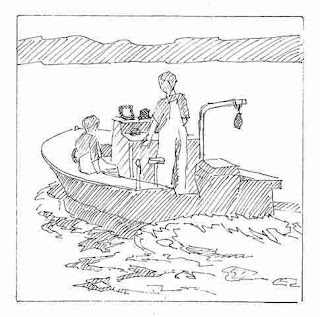 We happened on her pulling traps on one of our trips up to Boothbay in our boat. One year ago today, was my first post to this blog! I want to thank everyone for their support and interest over the last year. This has been such a wonderful experience. 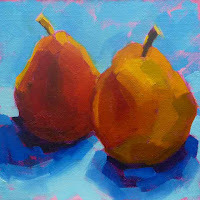 I have learned even more than I expected to, about mixing color, about composition, about painting deliberately, and about having fun. And I have met some really wonderful people, as we comment on each other's blogs and join in on challenges. You may remember the wonderful portrait challenge that Karin Jurick did in December, where 180 artists traded photos and painted each other's portraits. As a tribute to Karin, Jill Polsby organized the 118 Faces of Karin, where 118 of us painted Karin's portrait. This is my contribution. Check out all 118. This was great fun, and I want to thank Jill for organizing it. Do take a moment to visit her new blog. 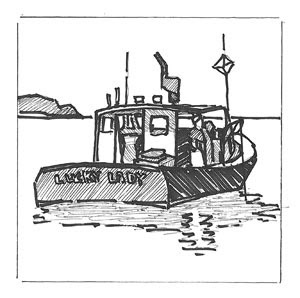 I am loving doing these drawings of lobster boats! I particularly like the Patricia G. She is such a classic, and she lives right around the point from our cottage. I promise that soon, I will start painting these wonderful boats. Here's another boat I really like, perhaps because the hull is bright yellow. Looks great against the blue water. I'll be giving this one a try as a painting soon. Painting summer is one way of being there. I want to announce my January Painting Giveaway Winner, which is my dear cousin, Ann McClain, who has made so many wonderful comments. I always have to smile when I read them. Ann has won "Beefsteak". I don't know about you, but I'm tired of winter. Down with snow and ice! 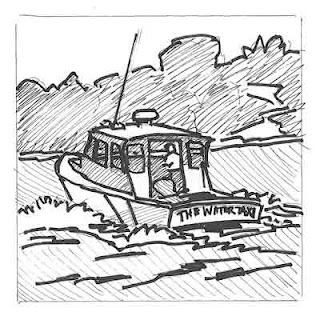 It's time to start thinking about warm summer days and the interesting boats we see when we are out on the water. 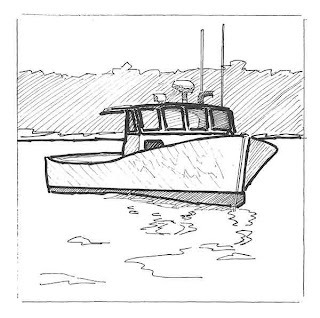 So I am gathering my boat photos, and doing some drawings in preparation for painting them. 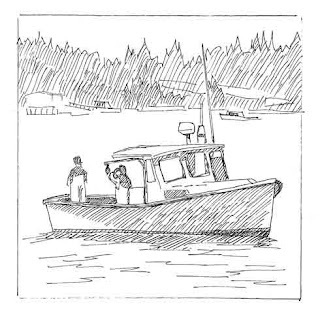 This is the Lucky Lady, a lobster boat out of East Boothbay. I think she's got style. 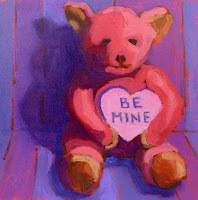 It was a busy day today, framing paintings, getting ready for the Valentine's Day Show at the Yarmouth Frameshop and Gallery, in Yarmouth, ME. The opening is from 4 to 6PM next Saturday, February 13th, and I hope to see you there. The paintings above are my contributions to the show.